One of the big problems with our prepackaged, modern, consumer spending-based economies is that everything is mass-produced in plastic with little or no regard for the future problems it creates. To date, 14 billion pounds of garbage are dumped into the ocean every year – most of it being plastic. 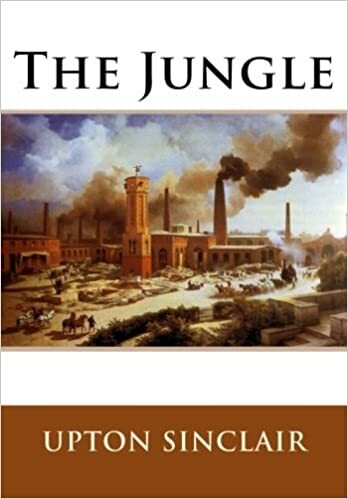 The book “The Jungle,” by Upton Sinclair basically was the blueprint that propelled the FDA into action against big industry and how detrimental it can be to the individual. Time, however, is the factor that erodes both conscience and consciousness, in that order. Each generation faces new challenges from a system designed to follow profit-potential rather than the welfare of the people confined within it. No exceptions are to be found in the food and beverage industries: most of their products are either unhealthy or outright poisonous due to dyes, preservatives or additives. No less the containers and packaging they are in. Recently several articles surfaced that categorized these problems. Rather than “rehash” the information, in a nutshell, I will summarize it. BPA’s (Bisphenol A’s) are chemicals used in plastic bottles, containers, and on the interior liners that are found in many food cans. This chemical has been in use for more than fifty years and is found to be linked to male infertility, low sperm counts, and prostate cancer, as well as, breast cancer in women. “Study Reveals Science Behind Soy Boys,” by Kit Daniels of Prison Planet, 2/5/18. “Bisphenol A (BPA) is Found in Plastic Containers, Water Bottles, and in Till Receipts,” by Victoria Allen, the Daily Mail, 2/4/18. 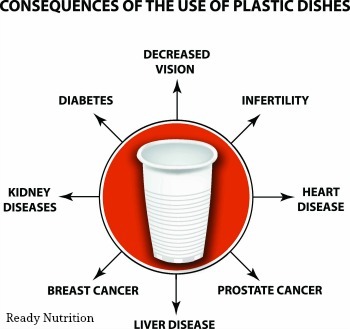 Moreover, it was exposed recently that plastic microplastic contaminants were found in 90% of bottled drinking water. Use containers for your drinking water that are not made of plastic, like this one. This will be extremely difficult for long-term storage. I have written extensively about the importance of storing a water supply. I’m not reversing my stance: life over limb instead of being “Mr. Particular” and agonizing over some things that cannot be changed. If you can afford giant, stainless-steel or porcelain water storage vessels…go for it. If you have only the plastic, then run with the ball as best you can. 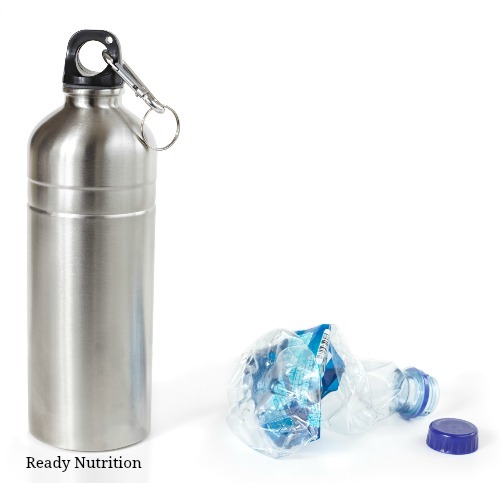 But tote your water on a daily basis and store water for your daily drinking needs in either glass bottles or stainless-steel bottles. You can also use wide-mouth 1-quart Mason jars. The biggest challenge you’ll face is the freezing temperatures of the winter. Fill your vessels up to about ¾ of the way to allow for some expansion if the vessel freezes. The steel bottles you can heat over a flame. The glass bottles, warm them up gradually. Use corning ware or smooth-baked porcelain in place of plastic food storage containers or cling-on wrap. These food wraps are made from beeswax and are washable and reusable. Use reusable storage bags instead of plastic food bags for storage. This is a great way to get away from plastics and teach mindfulness to the youngsters. We also found these reusable bread storage bags that could be used when buying bread at the bakery. Heat up your food in the oven and not in the microwave…this will enable you to use that corning ware you store your food in. For food freezing or long-term storage: use wax paper and butcher’s block paper…steer clear of aluminum foil…or any container of aluminum, for that matter. Check out all of your cookware beforehand for the presence of any BPA’s or chemical contaminants…Teflon-coated pans or pots are a No-Go, for example. Cast Iron and Stainless Steel…you can’t go wrong with them. Utensils and plates: go with metal and porcelain/corning respectively…avoid the plastic coatings and chemicals that are attached to them. Use your Internet resources and Consumer reporting firms (regarding products) to find out what chemicals are used in your foods, the packaging, and all of the products you purchase…before you purchase them. Wilderness and outdoor equipment: I use two WWII-era steel one-quart canteens with cork liners…I mentioned I prefer the canteens to the Camelbaks. One of the reasons is the steel canteens can be heated up. I also use the issue canteen cup (made of steel) for my Morning, Joe, when I’m out in the woods. I recently wrote several articles about chelation therapy, and the herbs used to remove heavy metals from your system. I highly recommend going back and reading them. When you pick up your groceries, if you can shop at the coops or the Hutterite or Mennonite farms for your meats and produce, by all means: eliminate the chemicals in this manner. If you are forced to continue to buy from the grocery stores, I recommend researching how you can clean up or remove chemicals from your food, as the depth is beyond the scope of this basic article. This piece will get you started with ideas and help you in the first step: to become aware. The next steps are up to you. JJ out!